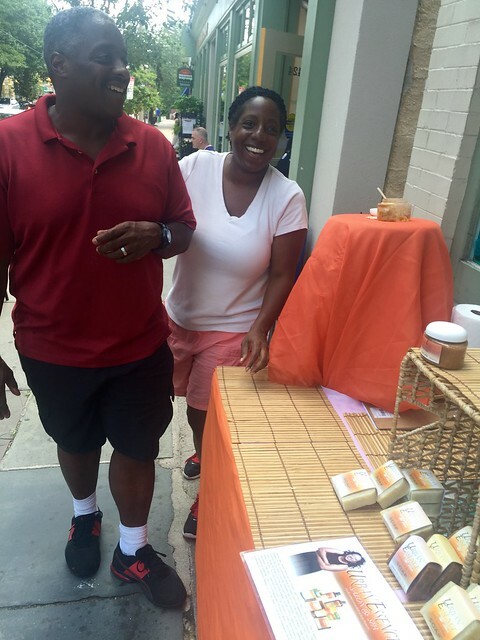 Tim Minor and Theresa Peoples who originally were in IT fields started a bath and body business 14 years ago because they wanted soap where good ingredients like shea butter, coconut and olive oils were the primary constituents. Theresa concocts the soaps and Tim builds the molds to hold them. They experiment with new products: pureed cucumbers work just fine for their "cool cucumber" but not all fruits are amenable to the hot, lye using process. The couple also runs a mobile spa, giving massages and applying their fragrant essences. They were outside of Weavers Way Coop, one location where they market their locally produced products, as part of "meet the makers day."